The Heritage Newspapers that Heinz Prechter bought from a corporate chain link back to 1879 when the News-Herald was first established in Wyandotte. Journalist William Mellus added another link to the chain when he founded the Mellus Newspapers in Lincoln Park in the 1930s during the Great Depression. In 1985, the Mellus Newspapers merged with the News-Herald, operating under the name News-Herald. In 1986, the Mellus newspapers moved out of the building in Lincoln Park that had housed them for 40 years, and operated out of the News-Herald office in Wyandotte. Then in 1988, the News-Herald moved to One Heritage Place at I-75 and North Line Road in Southgate. The circulation area of the Heritage Newspapers covers southeastern Michigan from Dearborn to Ohio and from Grosse Ile to Chelsea, including the communities of Allen Park, ann Arbor, Belleville, Brownstown, Chelsea, Dearborn, Dearborn Heights, Dexter, Ecorse, Flat Rock, Gibraltar, Grosse Ile, Huron Township, Lincoln Park, Manchester, Melvindale, Milan, Monroe County, River Rouge, Riverview, Rockwood, Romulus, Saline, South Rockwood, Southgate, Taylor, Trenton, Warrendale, Woodhaven, Wyandotte, Ypsilanti. And Ypsilanti, Augusta, superior and Pittsfield Townships. Katherine “Kitty” Keenan, the maternal grandmother of William Mellus, and her husband, Fred Comerford, were second-generation Irish Americans from County Cork. 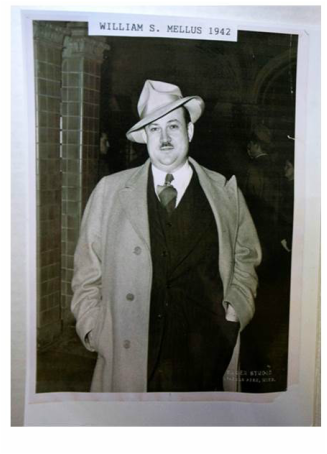 Geraldine Mellus Collins wrote in her memoir that after Fred died at age 37, Kitty married a Norwegian sea captain named Iverson who commanded Ford Motor Company ships carrying ore from Norway across the ocean and up the Detroit River to the steel mills. On November 15, 1921, 18-year-old William Sylvester “Bill” Mellus, and his childhood sweetheart 20-year-old Violet Cecelia Comerford boarded the streetcar to Toledo, Ohio to elope and be married by an Ohio justice of the peace. They boarded another streetcar and returned to each of their homes, keeping their marriage a secret until the birth of their daughter Geraldine on February 12, 1923. Geraldine was born in the home of her Grandma Marcella Mellus on Lisbon Street in Southwest Detroit. She wrote that as a young child she couldn’t pronounce her name, Geraldine Mellus. The best that she could do was “Genie Mouse” and eventually even her father Bill Mellus called her Genie. The 1930 Federal Census shows William S. Mellus, 26, Violet Mellus, 28, and their children Jeroldine, 7, and Shirley 4, living on Lisbon Street in Detroit across the street from his parents. The Great Depression had gripped America in its talons, and Geraldine remembered hungry men coming to their house asking for food. Her mother gave them cans of beans and spoons and they would sit on the steps eating their suppers. “It was a very bad time,” she wrote. According to Geraldine Mellus, her father Bill provided well for his family and in her memoir she states that his entrepreneurial spirit began to reveal itself when he sold newspapers at dawn each day on a street in front of the neighborhood police station at the age of seven. When he and his sisters Bernadine and Marcella were kids, each year they made Christmas wreaths that Bill sold door-to-door from his wagon. He dropped out of high school in the 10th or 11th grade, but his entrepreneurial spirit had been alive and well for years. Newly wed, Bill Mellus followed his love of newspapers and went to work in the circulation department of the Detroit News. To relax he went to the Michigan State Fair and consulted a fortune teller operating out of a booth about his career. The gypsy fortune teller told him that she saw newspapers everywhere. The fortune teller’s prediction must have stuck in his mind, because soon after this, Bill took his wife Violet for a drive, passing the office of The Wyandotte Tribune. Bill told his wife that he intended to apply for a writing job there and the Tribune hired him. After a few months, Bill Mellus decided to publish his own newspaper, cobbling a $750 stake from his savings and family loans. His fledgling newspaper went broke within nine months, so he went to work for Edward B. Gibbons, who owned four Downriver area newspapers. He worked for Gibbons for nine years. In 1933 in the middle of the Great Depression, Bill Mellus launched his first four Mellus newspapers with a 5,000 circulation, eight page weekly newspaper. He grossed $275 his first week. Locating his first Mellus Newspapers office in an upstairs room of the family house on Lisbon Street, at first Bill Mellus produced the newspaper himself. Since her bedroom adjoined the office, Geraldine Mellus remembers her father typing in the office at all hours with a constantly ringing telephone accompanying the noise of the keys. Later he moved downstairs, converting the whole basement into his office. Finally, he started hiring reporters and a steady stream of people moved back and forth through the Mellus house. Many of his employees and friends nicknamed him “Wild Bill” and others called him “Battling Bill.” He earned the nickname of “Battling Bill” because his newspaper was published on Wednesday and he set aside Thursday mornings to deal with angry readers. Some of his angry readers included corrupt politicians he exposed who would storm up to his office, threatening to punch him in the nose. Geraldine wrote that at this point, her father weighed about 260 pounds and used his stomach as a battering ram. He usually won. As a crusading newspaper man, Bill Mellus made many enemies. One night in 1930-1931, when Geraldine was seven or eight, her father came home stating that somebody was after him. He slammed the door, pulled down all the shades, and sat on the floor by the window with a gun at the ready. He wouldn’t let his two daughters go to the movies alone, always taking them and picking them up afterwards. Battling Bill fought one of his most dangerous battles against the Black Legion, an organization modeled after the Ku Klux Klan, which in 1935 had approximately 100,000 Michigan members. He exposed the “hooded avengers and killers of the Black Legion” by publishing their names on the front page of his newspaper. The list of names included many prominent local businessmen and attorneys and appointed officials, even police officers. Battling Bill’s courage earned him the honor of being marked for death twice in 1935. The police chief thwarted the first plan to shoot him in typical gangland style. The second plan the hired killer cancelled himself. This plan required the hired killer to poison Bill, his wife Violet, and his daughters Geraldine and Shirley. The killer said that he wouldn’t mind poisoning that blanket blank Mellus, but murdering his family went too far! Because he had painstakingly taught himself grammar, Wild Bill imposed his strict and exacting grammar rules on his family, friends, and employees. Anne Carins Federlein who later became the President of Kentucky Wesleyan College, worked at the paper in the late 1950s and early 1960s. She recalled the unending grammar arguments Wild Bill had with Nick Raar, the managing editor of the paper. Wild Bill would smoke a cigar and Nick would smoke cigarettes and Wild Bill would rant while perched on the edge of the chair in Nick’s office. “They would argue over a comma as though they were in charge of the English language,” she recalled. Anne also vividly remembered her stints working the switchboard. She said that the only time she remembered Wild Bill tame and gentle happened when his wife Violet called. Switch board operators had orders to put her through immediately. She never had to wait to talk to her husband and while they talked he remained calm and sweet. Then the minute Wild Bill hung up the telephone, he began barking orders again. Another of Anne’s vivid memories also involved working the Mellus switchboard. Process servers would regularly call Wild Bill, who kept his Cadillac in a garage in the alley. He left standing orders for anyone on the switchboard to call him and tell him someone wanted to see him when the process servers came through the front door. Anne or whoever was operating the switchboard would tell the process server that Bill would be right down. In the meantime, Wild Bill came right down the back stairs and out the back door! Geraldine, her sister Shirley and her mother Violet used to go “calling” with Bill Mellus. Even if they had plans to go to dinner or visiting at someone’s house, they often stopped at a business so Bill could sell and advertisement. Violet Mellus spent many hours waiting for him and according to Geraldine, they were late for any airplane they took to any destination, because he always had to stop to call the office which by then was located at 1661 Fort Street in Lincoln Park. Over the years and under the direction of Bill Mellus, the Mellus Newspapers won countless local, state, and national awards for editorial excellence. He earned praise for his marketing skills. One of his techniques involved using green paper stock instead of the usual white color. In another marketing strategy, he required his newsboys to hang the papers on the doorknobs of every subscriber. After that, Bill took the advertisers around and showed them block upon block of houses with a Mellus Newspapers on every doorknob. Continuing to crusade while retired, Bill Mellus fought more battles against anyone he felt was abusing the public trust, including a local bank that he eventually sued. When the bank tried to serve him with a restraining order, Bill hid out in his Grosse Ile house for a week, and then got a pilot friend to fly him by helicopter to a card game in nearby Wyandotte. “I wasn’t going to let a little lawsuit stand in the way of my weekly gin rummy game with the boys,” Bill told the Detroit News in 1975. The Detroit News published a front page story about Bill and his restraining order, compete with a photo of Bill getting into the helicopter. Violet and Bill Mellus were relatively young grandparents – Violet 42 and Bill 40, when their daughter Geraldine and her husband Cy Collins had their first baby, a daughter named Kay. Bill resolved to spoil his grandchildren and later on great grandchildren and he and Violet did, so taking them on several trips and providing a stream of grandmother and grandfather presents. Geraldine recalled in her memoir that a week or two before he died on March 30, 1979, Bill told her that he regretted not being a more involved father to her and her sister Shirley. “I was always too busy. I worked too much,” he said. A story published Friday, February 13, 2015 issue of the News- Herald and a tribute appearing in the Trenton Tribune illustrate the contribution that publisher Ernie Nagy made as a link in the Heritage Newspaper chain. In his story titled “Retired publisher Ernie Nagy remembered for community involvement; helped to bring together Downriver newspapers’ writer Jim Kasuba detailed Ernie Nagy’s early Downriver years. In this 2013 photograph, Ernie Nagy poses in front of his tribute wall featuring mementos of his 52-year newspaper career and some of the radios in his collection. Photo by Karin Beary, The Grand Traverse Insider. Almost everyone who knew him called Ernest Nagy, Ernie, and for the last fifty years of the 20th century, Ernie symbolized Downriver newspaper publishing. When Ernie died on Wednesday, February 11, 2015, at age 85, Downriver mourned. Ernie’s Downriver story began when his parents, George and Bertha Nagy, immigrated to the United States from Hungary in 1921. Nine years later, Ernie was born on January 15, 1930, in Lincoln Park. When he turned 12, Ernie went to work as a paperboy for the Mellus Newspapers, and his route included the area along Fort Street stretching from North Line Road to Eureka Road. He earned a promotion as carrier supervisor while still in his teens. In 1944, he presented war bonds to carriers with one year of perfect service, and Marilyn Snedden was one of the carriers winning a bond. Later, Ernie hired her as his assistant in the circulation department and on January 24, 1953, they were married. During his career at Mellus Newspapers, Ernie worked his way up from carrier, to carrier supervisor, circulation manager, advertising salesman, layout artist, production manager, sales manager, and director of advertising. 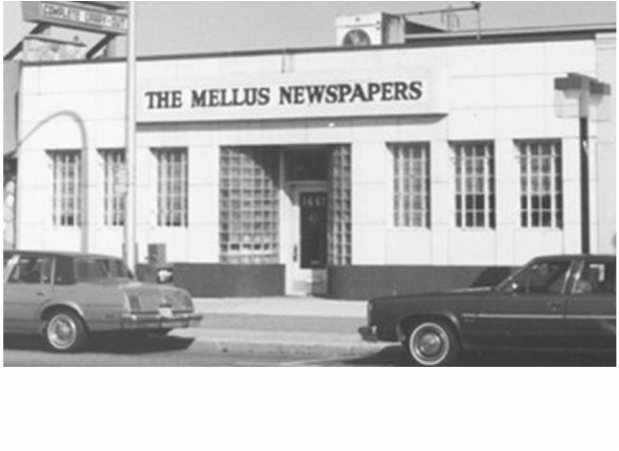 William Mellus sold his Mellus newspapers to Panax Corporation in 1969, and by 1978. John P. McGoff, president of Panax Newspapers had promoted Ernie to publisher of the Mellus Newspapers. Ernie endured and helped his fellow workers endure the time when some of the newspaper employees went on strike in 1978. In a 1986 interview, Ernie said that he liked to joke that he enjoyed a quick 36 year rise to publisher. Many newspaper people believe the highlight of Ernie’s career came in the mid-1980s when John McGoff attempted to sell his chain of newspapers which included the Mellus, Wyandotte News- Herald, Flat Rock Guardian, Grosse Ile Camera, and Dearborn Press & Guide. Ernie feared that the Panax Corporation would sell his Mellus newspapers that he had shaped for so long to a national chain that would destroy their local identity. By now, the newspapers had grown locally to include the merged Mellus and News-Herald Newspapers, as well as the former Trenton Times. Ernie Nagy joined forces with the late Shirley Henry who published the Press & Guide and John Tarrant, then the News-Herald publisher, and they approached Heinz Prechter about buying the newspapers. Reluctant at first, Heinz Prechter credited Ernie with convincing him to buy the newspapers. After the sale he said that Ernie was the one who approached him with the idea of buying the newspapers, “I never would have thought of it,” he said. Until he retired in December 1994, Ernie Nagy served as executive publisher of the Heritage Newspapers chain. Frederick Manuel succeeded Ernie Nagy as executive publisher, felt that Ernie deserved to share Heinz Prechter’s honorary title of “Mr. Downriver,” because “he took pride in being from Downriver and helped us all see the possibilities for the entire region.” He said that Ernie understood that every person in the community had an interesting story to tell and the newspaper had the job and responsibility to tell their stories to the community. The Nagy family lived in Trenton for 32 years, but when Ernie retired in December 1994, after a 52-year career with the same newspaper chain, he and Marilyn lived in Elk Rapids during the summer and Marco Island, Florida, during the winter. 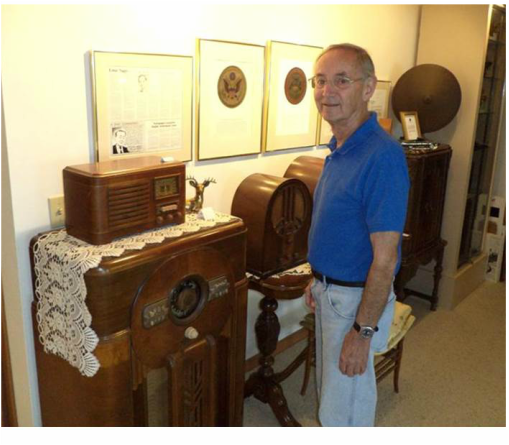 After he retired, Ernie resumed his childhood interest in radios, and built a collection of over 700 antique radios. He was a board member of the Michigan Antique Radio Club, and the Club gave him a lifetime achievement award in 2014. Geraldine Mellus Collins. Northville, Michigan. 2010. John Mcgoff . New York Times. Panax Corporation.